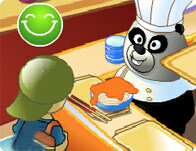 Manage a top burger shop and cook the burgers to satisfy with the needs of customers. The game is simple and easy to operate. How fast can you cook?